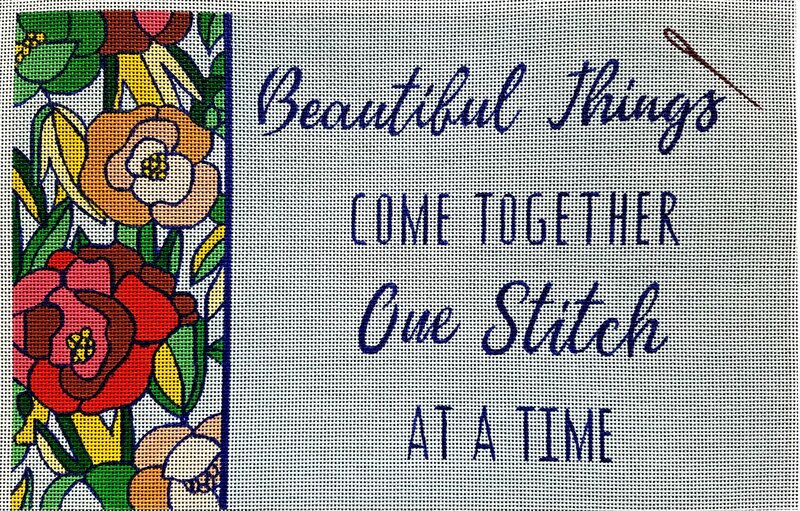 A handpainted needlepoint canvas with a saying "Beautiful things come together one stitch at a time." The design features a lovely art deco style floral panel and navy writing on a pale grey/blue background that could actually be stitched in any color. Measures 16" x 10" on 13 mesh mono canvas. Use the drop down menu to select threads if you need them. For cotton we will send DMC floss; wool and silks are from Planet Earth and are used single ply on this 13 mesh canvas - super easy to stitch with. If you need stretcher bars to hold your canvas taut while you stitch then we recommend a pair of 20" and a pair of 14" and some thumb tacks. This Beautiful Things saying design is suitable for stitchers who have already completed at least one or two basic projects. The florals mean lots of color changes but also lots of interesting places to stitch in fun colors. Be sure to contact us if you have any questions - we're always happy to help.